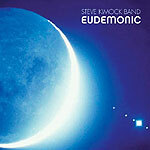 Steve Kimock is one of those artists with such singular vision that they're off in a genre all by themself. In Kimock's case, we could call it jam fusion. Or fusion jam band. Something along those lines, because Kimock's smooth, grooving guitar improvisations are a cross between the Grateful Dead and mid-'80s Lee Ritenour. His newest album, "Eudemonic," contains more of the same fertile instrumental ensemble improvisations his fans have come to expect. Surrounded by longtime drummer Rodney Holmes, plus bassist Alphonso Johnson, keyboardist Jim Kost and second guitarist Mitch Stein, Kimock turns the various melodic themes inside out eight ways from Tuesday. Sticking to his trademark sound  a bit countrified, like Mark Knopfler's, but also deeply immersed in jazz  Kimock changes gears easily, going from a Chet Atkins kind of jazz breakdown on the opening track to a kind of Middle Eastern groove on "The Bronx Experiment." Kimock isn't a wild experimentalist, but a solid musician who can improvise with the best jazzmen while remaining in the rock mainstream.